I have lots of recipes but in general I stick to meals that are easy to throw together and can pack as many of our homegrown veggies in as possible. I have about 5 go to recipes that meet this criteria but was getting in a bit of a rut when I decided to look to the internets to give me inspiration. The other day I went out to Korean food with my parents. I don’t eat Korean food all that often so when I do, it’s a treat. I had a fantastic vegetarian bi bim bap at the restaurant but after we left I started thinking about soondubu jjigae. 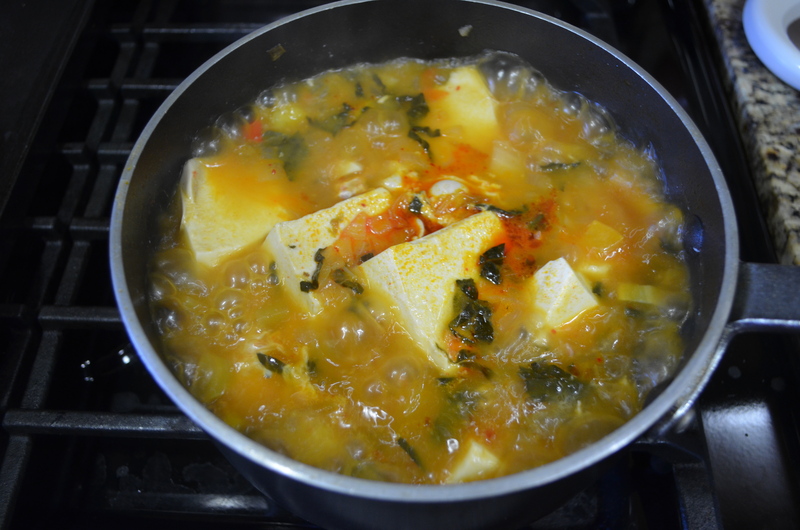 Soondubu is a kimchi soft tofu stew. It is served bubbling hot in its cooking vessel at restaurants. I just couldn’t get soondubu out of my head. Then I thought… I probably can make that myself. So I did. And to my surprise, it was so easy AND you could throw any veggies you have in the garden into it. This might not be the most traditional of recipes but it worked for me. Any other veggie you have in the garden! First of all, you can basically throw anything into this pot so if you have veggies that you need to use up this is a great recipe to try. Second note, the kimchi I bought was pretty spicy on its own so I didn’t put any of the chili paste in. It was still delicious and just the right amount of heat. Adjust to your liking. 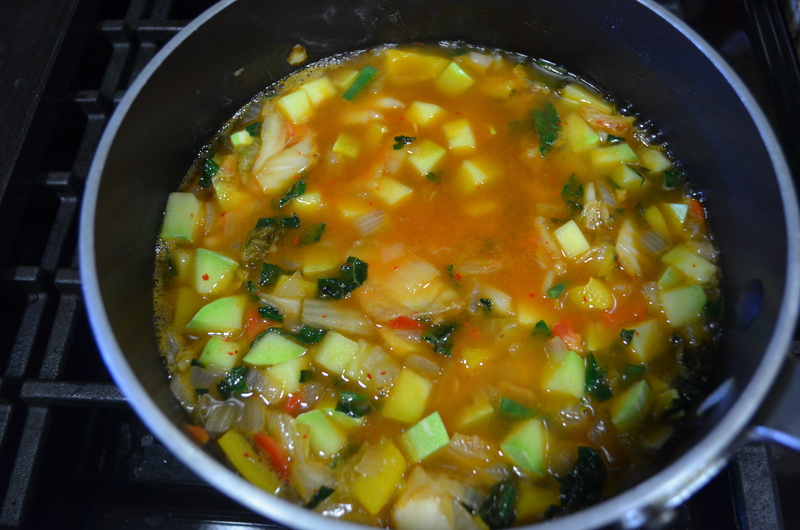 Also the original recipe only calls for zucchini as the main veggie so if you do end up adding more vegetables to the dish, I recommend adding some extra broth for a more stew like consistency. The veggies I grew in my garden that I decided to put in this dish were Trombetta di Albenga squash, Sweet Canary Bell Pepper, Hungarian Yellow Wax Pepper (for some reason these are supposed to be yellow but they are ripening as red… I saved these seeds from last year so maybe I mislabeled or they crossed!? ), Orient long green beans and some Lacinato kale. Heat the oil in a large saucepan with a lid on medium heat. Add onions and cook until softened about 5 minutes. Add salt. Add the chili paste, stir to combine, until fragrant about 1 minute. 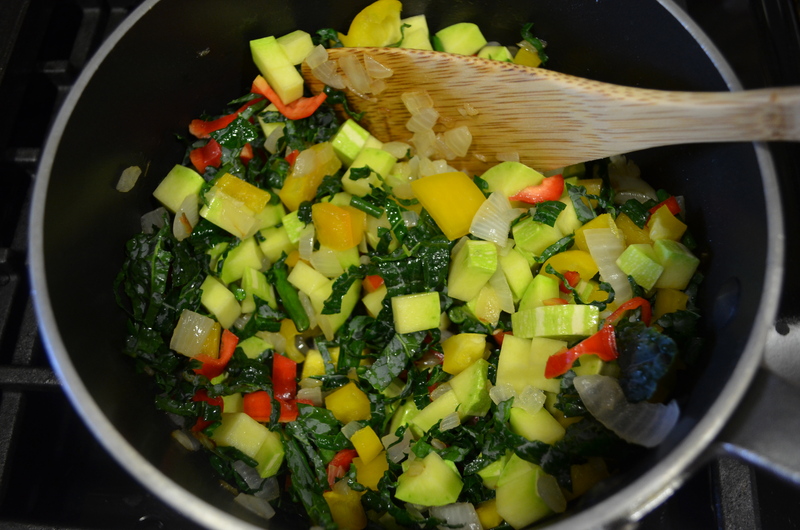 Add the zucchini and let cook for about 5 minutes if using Trombetta. This squash is harder than Black Beauty zucchini so I gave it a little more time in the pan. If you are using a softer zucchini just stir for about a minute. Add any other veggies at this time too. 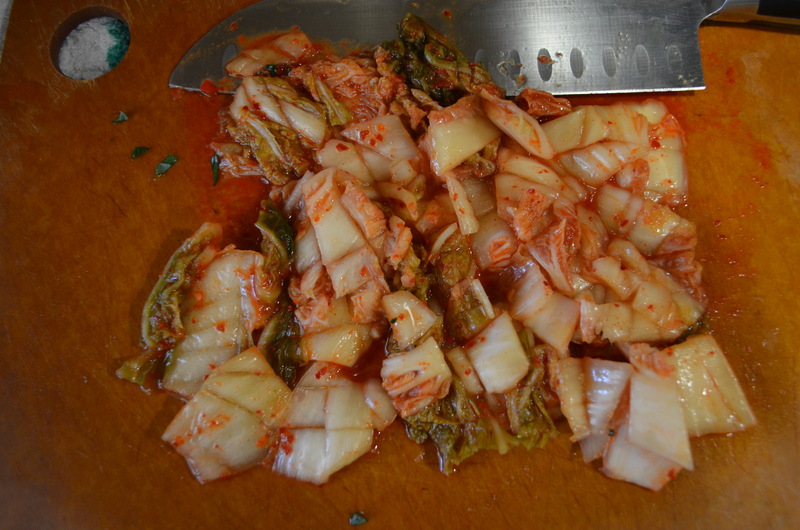 Roughly chop the kimchi and add, stirring occasionally for about 2 minutes. The kimchi should start to simmer. Don’t forget to add in those kimchi juices! Add the broth and the soy sauce and bring to a boil. Taste and season with salt if needed. Cook until veggies are almost done. 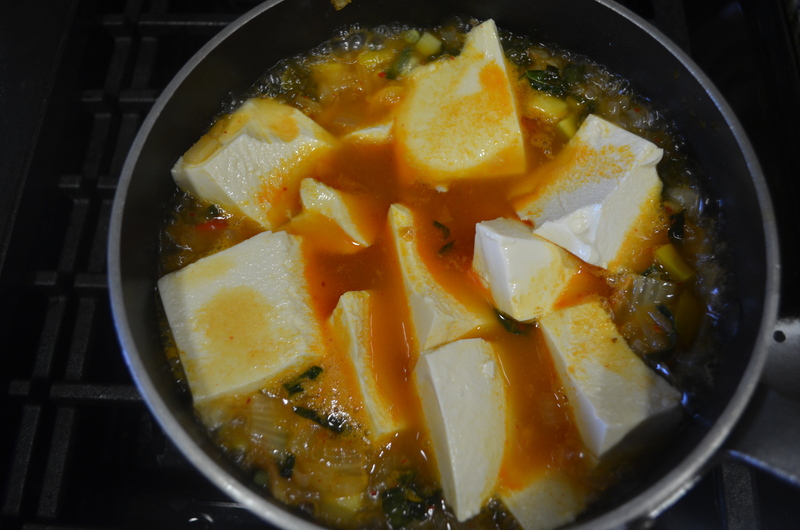 Using a large serving spoon, add the drained tofu in very large spoonfuls careful not to break into smaller pieces. Gently press down into the soup until covered. Cover with lid and simmer for another 3 minutes. Crack eggs into the simmering stew. Cover and simmer until whites are set (about 2 minutes). Dish the stew into bowls careful not to break the tofu or the egg yolks. Garnish with scallions and serve immediately with a side of rice. This stew is hearty, healthy and perfect for fall. Enjoy! Next on my ever-growing list to do is: grow Nappa cabbage (I already have seed!) and learn how to make kimchi! 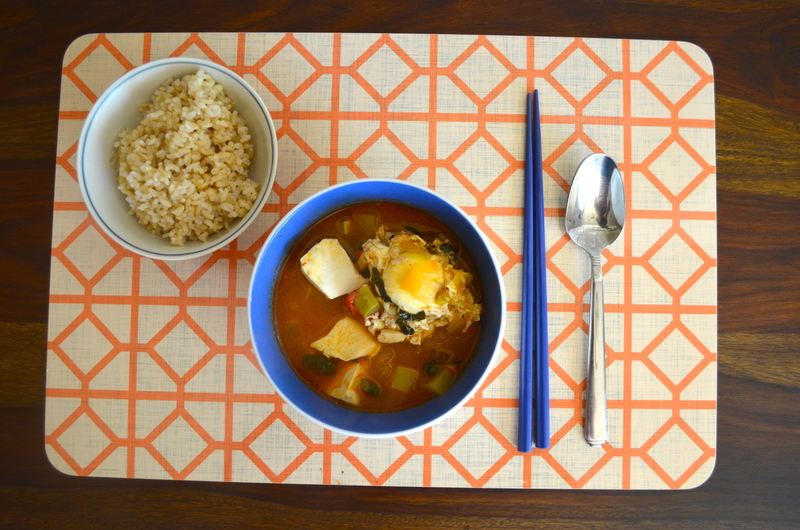 Tags: from garden to table, kimchi, Kimchi Soft Tofu Stew, Soondubu jjigae, Trombetta di Albenga | Permalink.